A straightforward multi close to the fine Church of Landrake. Roadside parking is usually available somewhere in the village but the streets are very narrow. Landrake church stands atop a hill and can be seen for many miles around. It is famous for the large illuminated cross on top of the tower which shines out at Easter and Christmas every year. In Saxon times, the River Lynher marked to boundary between Saxon England and the Celts. Landrake was an important location near to a crossing of the river. The earliest reference is in 1018 when King Canute granted land to Bishop Burwold for his life and then to pass to the holy Germanies which links with St Germans. The original wood and wattle church was re-built in stone by the Normans and some of this original stonework still exists in the South doorway and the main aisle of the Nave. 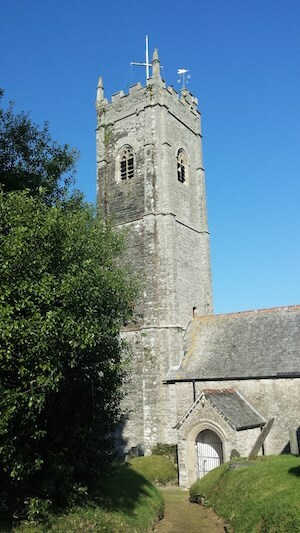 In the 14th and 16 th centuries the village was badly hit by the plague and this is the reason that the 100 ft tower took 50 years to build and was completed in the early 1400's. The church as it is today was constructed in 15th century and the stone came from a local quarry. There are many fine wall plaques inside the church memorialising local famous and wealthy people. In the alcove of the north wall of the Sanctuary is one of the oldest brasses in Cornwall dating from 1509. Behind the alter is an ornate marble carving which is illuminated by electric lights on special occasions. If the church is open during your visit it is well worth a look around. There are a number of entrances to the church grounds but the headline coordinates take you to the entrance porch of this fine church. Opposite the porch entrance is a ground level plaque to Dorothy Oginskey. The cache is a short walk away but requires the crossing of the busy A38 - please use the footbridge from which you have spectacular views to Dartmoor to the east and mid-Cornwall to the west. Enjoy your short walk through the village and imagine what it must have been like before the bypass was built. The cache is a camo'd plastic tube 10 cms long by 3 cms in diameter. Please be STEALTHY at the final location and tuck the cache back into its hiding place. You may need tweezers to extract the log and please BYOP.
! !Please DO NOT attempt this cache at night.!! Ghpxrq va orfvqr yrsg unaq tngr cbfg ybj qbja. Ab arrq gb tb guebhtu vagb gur svryq.